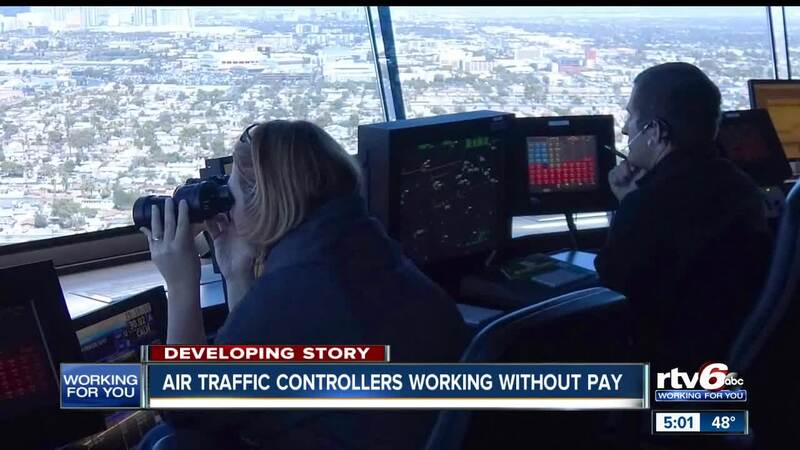 INDIANAPOLIS — More than 300 air traffic controllers work in Indianapolis and they are beginning to feel the pain of the partial government shutdown. The jets continue to fly and the controllers continue to make sure that there is no chaos in the skies — but there is a price. Air traffic controllers are trying to keep your flight safe, even as they do it without pay because of the government shutdown. "We are working 6 days a week. Some are working 10 hours a day, that's across the country," said Marc Schneider, National Air Traffic Controllers Association president. "We are at a 30 year low in staffing for air traffic controllers nationwide. The school in Oklahoma City is shut down." According to Schneider, controllers were recently trained on new technology that allows them to text message pilots in the cockpit. This was supposed to roll out Friday and now isn't happening because of the shutdown. If it is not implemented by January 15, all the controllers will have to be retrained — at a high cost. "It's a stressful job to begin with. These are people's lives we are dealing with," Schneider said. "Everyone just got done paying for Christmas and now there is no money coming in. Those are things we have to worry about." Also at the airport, folks who work for the Transportation Security Administration are on the job, and not getting paid. They are represented by the American Federation of Government Employees, who handle 30,000 workers in Indiana, Ohio and Kentucky. That body is filing a lawsuit against the federal government. "We're saying it's against the law to work employees without paying them. These are not slaves. It's against the law," said Arnold Scott of the American Federation of Government Employees. "The fair labor standards require federal employees be paid for the work that they perform." The hope is that the lawsuit will never get a hearing because the government will reopen.